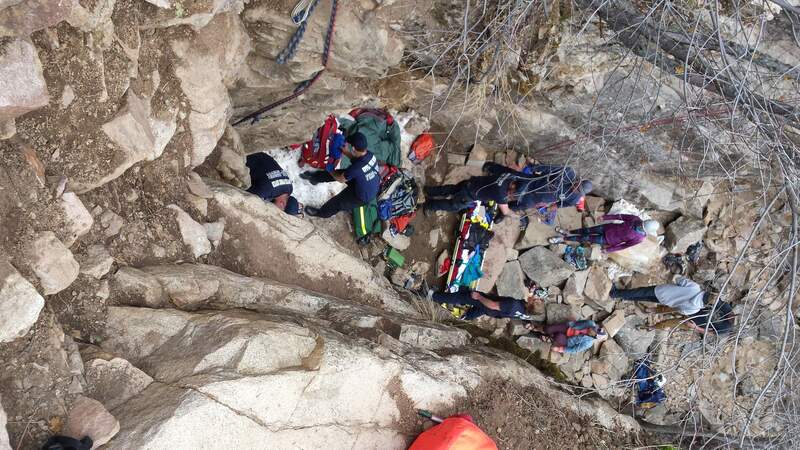 A rockfall Saturday injured two climbers north of Lemon Reservoir. Two women who were injured while climbing Saturday afternoon northeast of Durango suffered moderate injuries and were in stable condition Sunday afternoon, said Upper Pine River Fire Protection District Chief Bruce Evans. Search and rescue personnel responded around 1:30 p.m. Saturday to a report of two injured climbers at the Transfer Park Campground located at the north end of Lemon Reservoir, a popular climbing spot. The two women’s names had not been released as of Sunday afternoon. A boulder struck the women after a large section of rock on the south bank of the climbing area in the Florida River canyon gave way, Evans said. One woman was climbing up the rock face and the other was belaying from the ground. Tom Brueckner of La Plata County Search and Rescue said Saturday the boulder was about three times the size of a microwave. The climbers required extraction, which involved taking the two across the Florida River and then up a steep embankment. Brueckner called the rescue relatively simple because the river is flowing at a low level. A Flight for Life helicopter landed, however, the climbers were taken by an ambulance to Mercy Regional Medical Center, arriving around 3:30 p.m. Saturday. In all, the rescue operation took more than 80 minutes, Evans said, involving 12 firefighters from Upper Pine and 23 volunteers from La Plata Search and Rescue, which regularly train in the area. Evans said it’s advisable climbers that plan on recreating near Transfer Park carry an emergency beacon due to the lack of cellphone coverage in the area. And, he suggested, climbers take emergency response classes. “Last year, a wilderness first responder in this very same area made a lifesaving move on a fallen climber that made all the difference in the world,” Evans said. Evan is referring to an incident where a 40-year-old experienced rock climber from Durango fell 100 feet last September and suffered serious injuries. A group of Wilderness First Responders that was climbing in the area came to his aid.